I know most of the coverage of Yao the past week was mainly about his charity gala on Sunday, March 28th. But other things were going on in Yao’s world this week. Yao’s Shanghai MAXXIS Sharks, the team he purchased before the season began, made the semifinals for the first time in eight years, beating the Liaoning Panpan Hunters in overtime last week. Yao watched the game from Houston on his computer early in the morning. Former Rocket John Lucas III was outstanding, scoring 41 points in the game (12-of-25 FGs, 6-of-10 3-pointers, 11-12 from the line). 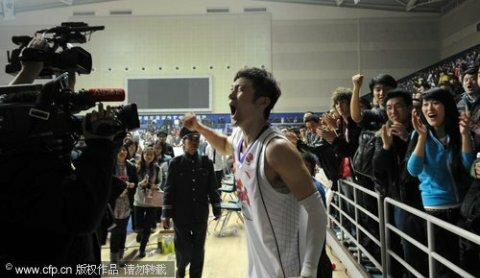 Liu Wei, Yao’s best friend, scored 36 points on 15-of-24 shooting, and 5-of-8 from three). You can tell by the photos below that the win was a big deal for the Sharks, who were “rock bottom” in the China Basketball Association last season and weren’t expected to do this well this season with a new and unproven coach. Click here for more photos from the post-game celebration. 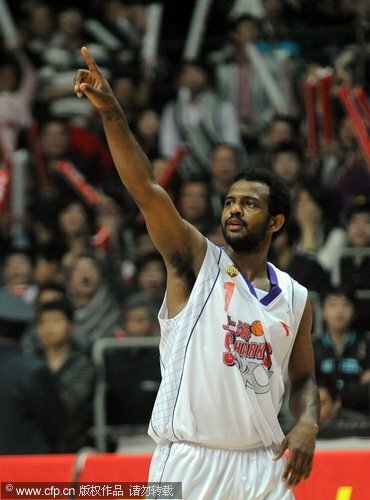 The Sharks are now playing the defending champions, the Guangong Hongyuan Dongguan Bank Tigers in the semifinals. Over the weekend, the Sharks lost Game 1 110-106. Former NBA player Smush Parker scored 40 points. Game Two is Wednesday in Dongguan, then the series goes to Shanghai. 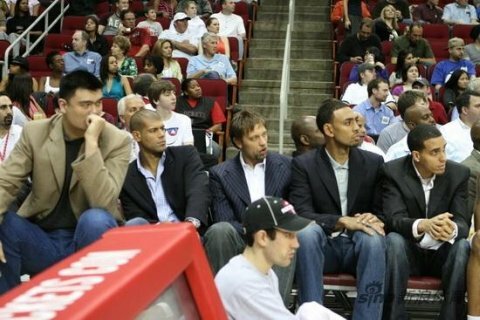 Last Tuesday, Yao attended the Rockets-Wizards game at Toyota Center, and once again, was joined on the bench with the walking wounded: Shane Battier, David Anderson, Jared Jeffries, and Kevin Martin. This entry was posted on Monday, April 5th, 2010 at 7:58 pm	and is filed under Miscellaneous. You can follow any responses to this entry through the RSS 2.0 feed.